Whenever someone says new wave in the 1980s, the first artist to enter my brain is Missing Persons. For me, they were everything I thought new wave was back then. They weren’t hard or heavy like metal but they didn’t sound like a trendy top forty band or even synth pop. They were completely different in a good way. 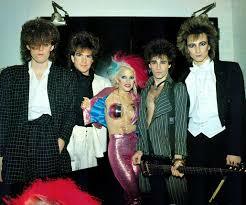 Furthermore, Missing Persons was a band who could actually play well. Then again, any band that features the likes of Terry Bozzio, Warren Cuccurullo and Patrick O’Hearn has to be good. If those names sound familiar it is because these three played with Frank Zappa throughout the late 1970s and early 1980s and as we know, Zappa always had the best musicians playing for him. So it was quite clear that Missing Persons weren’t going to be a Tinseltown Rebellion band that Frank recorded a good parody about. Before I launch into the fullness of Missing Persons’ 1983 album, “Spring Session M,” I would start with the singles from the album. The first one I heard on the radio upon my return from serving in the Far East was “Words.” My first impression of it was that the lead singer was trying to sound like a fourteen year old girl. At first, I thought it was amusing but listening behind the vocals, I heard the music and it sounded okay. The guitar wasn’t heavy on a bang your head along to it scale but enough to catch my interest. The synthesizers were used very intelligently without taking over. My conclusion was that it was a good song after all. However, the third single, “Walking in LA” has a guitar hook that definitely works and Dale Bozzio’s voice sounds much better on it. The other single, “Destination Unknown” is a more way out there song with some good keyboard hooks. Those were enough to get me to listen to the rest of the album and I wasn’t disappointed. The rest of the album is as solid as the three singles. The songs are just hard enough to catch the ear of this metalhead and think, “This is okay” and the keyboards and synthesizers are done just as intelligently. Dale Bozio does not sound like a fourteen year old on the other songs, in fact her vocals are quite decent. Her best effort is on the track, “Tears.” However, the rest of the band plays consistently well throughout the entire album. The two opening tracks seem to stand out the most although “Bad Streets” is probably the closest they come to a rocker. It is the heaviest song on the album and done very well and Cuccurullo does hammer out a pretty cool guitar solo. If new wave had continued in this direction, I would have been more into it. 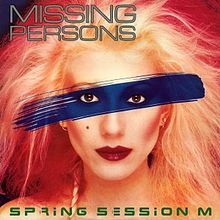 Missing Persons were talented musicians all as shown in the album “Spring Session M.” Unfortunately, things went down hill fast after this and my musical tastes went in a harder direction.